Published: Feb. 27, 2014 at 04:04 p.m. Updated: Feb. 28, 2014 at 05:03 p.m.
Safety Louis Delmas has begun making the free-agent rounds after being released by the Detroit Lions two weeks ago. 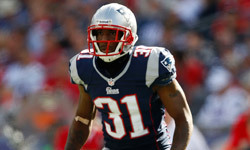 Having already visited the Pittsburgh Steelers on Monday, Delmas is meeting with the New Orleans Saints on Thursday, according to ProFootballTalk. The Saints have already cut Roman Harper and seem prepared to let Malcolm Jenkins walk in free agency. Delmas would be an every-down option opposite jack-of-all-trades Kenny Vaccaro in the defensive backfield. In addition to Pittsburgh and New Orleans, Denver and Atlanta have been floated as possible landing spots for Delmas. Because he was released prior to the 2014 league year, Delmas can sign with any team before free agency begins March 11. Gauging his value, he appears to be in no hurry to sign. Update: Add another tour stop for Delmas. The safety is visiting the Miami Dolphins on Friday, according to the Miami Herald.